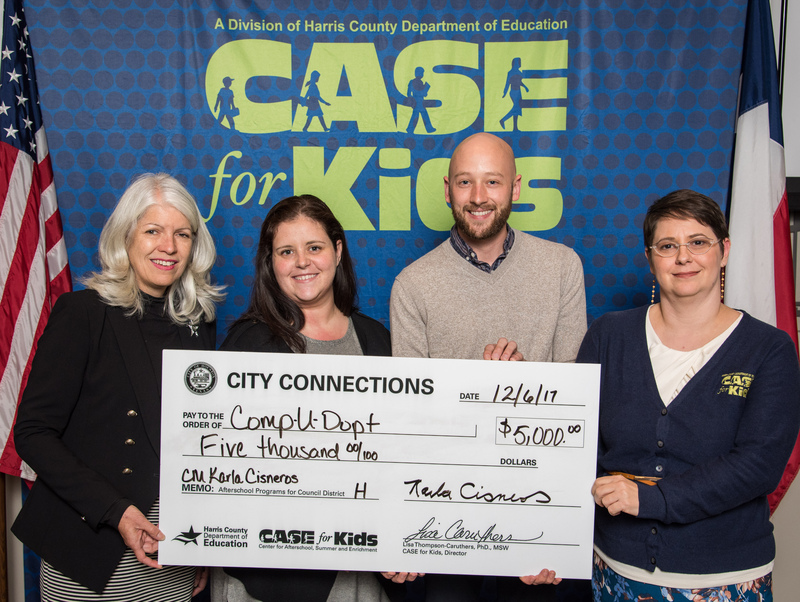 Dec. 6, 2017 – Citizens in 11 Houston City Council districts benefit for a fourth consecutive year from a $550,000 program funded by the City of Houston and administered by Harris County Department of Education’s Center for Afterschool, Summer and Enrichment for Kids called CASE for Kids City Connections. Nonprofit organizations in each of the council districts receive $45,000 in funding ranging from $5,000 to $15,000 for programs for children in grades K-12. Funding began Oct. 23 and continues through April 27. The city and CASE for Kids allowed school districts, charter schools, faith-based organizations or civic groups to apply through a request for proposal. According to HCDE Superintendent James Colbert, Jr., CASE for Kids City Connections is critically needed as Houston families continue to rebuild from Harvey. Council members are invited on Dec. 5 and 6 to meet the recipients of the funding which is awarded through a request for proposal via CASE for Kids. CASE for Kids will provide photos and networking between the council members and the nonprofit organizations. Several council districts are opting to increase funding for City Connections from their own council district service funds. Many are located in areas hard-hit by Harvey. To find programs funded in each of the council districts, access http://goo.gl/YfuAUw or learn more about City Connections at www.afterschoolzone.org.